Crowdsourcing Design: The End of Architecture, or a New Beginning? Why the criticism that crowdsourcing design sites like Arcbazar are taking jobs away from architects doesn't wash.
Houston: In the somewhat arbitrary hierarchy of fine art media, where painting is king, drawing is often considered less valuable. The new MDI elevates the medium by providing a distinguished, respectful home. Why Robert Dawson's photographic essay on the public library plays it safe by looking back when architects need to scan an emerging horizon. "We wanted to dive deeply into the culture of the school and understand its core values, so one of the first things we did was to participate in its daily life." For the successful partnership, it's all a matter of balance. What is "Quiet Design" and Why Should It Matter? Some Troubling Queries for Cathleen McGuigan and Sundry Fans of "Architectural Quietism"
Can great architecture be so subdued that we remain unconscious of even experiencing it as architecture? Ever been lost in a building, feeling your stress level rise by the minute? If so, the lack of effective EGD - environmental graphic design - is very likely the culprit. The Colombian architect talks about how good architecture and urban design can reach the greatest number of ordinary people. Principals already know what they love to do. It is learning to let go of the other, more mundane tasks that they find difficult. The fine arts today do not have the shared social purpose they once did. But the built environment is different. Architecture is a collective art form and a collective endeavor. An urban setting seared into the national consciousness. Some practical steps to make time for business development when you've been avoiding it or aren't sure how to fit it into your day-to-day practice. Dinners were better, breakfast was not, but the weather was stunning, and the AIACC did a great job recruiting regional, national, and international architects. 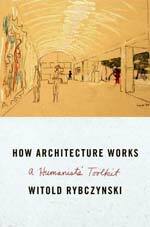 Witold Rybczynski's "How Architecture Works: A Humanist's Toolkit" might be his most urbanely written and sensibly organized books - but his traditional definition of architecture’s past might be passé. The contradictions and challenges of Los Angeles as a metropolitan conceit of perpetual promise continue. The Julia Morgan-designed Asilomar Conference Grounds in Pacific Grove, CA, will be abuzz at the biennial event September 27-29, 2013. How things are panning out on Melbourne's burgeoning skyline is questionable. But in the shadow of those weird towers, firms like Architects EAT are doing work that is subtle, refined, location-appropriate, and very beautiful. The history of our ill-fated Los Angeles County Museum of Art is told in "The Presence of the Past: Peter Zumthor Reconsiders LACMA": I'm a fan of Zumthor, but this building could be cool almost anywhere else. Hiring a DOO has the potential to significantly increase revenues while creating an environment where designers design, not manage!